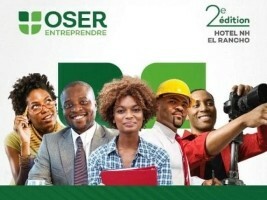 Saturday, December 7th and Sunday, December 8th at the Mariott Hotel and at the NH El Rancho, will be held the 2nd edition of the annual entrepreneurship forum "Oser Entreprendre 2018", whose mission is to support the development of startups, remind the organizers of Forum gathered in "KOLEG", a community service institution dedicated to economic and social development. "This second edition will be open to the general public, political decision-makers, artisans, artists and project leaders from Haiti and elsewhere," says Angelore Raymond, Coordinator of "Oser Entreprendre". This Forum will give the floor to about 30 experts on entrepreneurship, including 24 local and 6 international specified Herwil Gaspard Executive Director of KOLEG. According to the organizers, this Forum aims through training sessions, exhibitions and conference-debates in the form of workshops to stimulate economic growth through entrepreneurship; promote entrepreneurial diversity; Bridging the gap between entrepreneurs at various levels create a workspace between the different Haitian and foreign entrepreneurs and support some companies that wish to build their capacities.